The data presented here makes it apparent that the Kinect™ can be a useful tool for palaeontologists. Although the sensor, and thus resulting model, lacks the resolution needed for smaller detailed scans, or for archival purposes (which should always be carried out at the highest resolution available), it is able to quickly capture the morphology of a specimen, and produce a digital model that requires only minimal post-processing. One area set to particularly benefit from using the Kinect™ sensor is in body mass and biomechanical simulations, where models are required of individual bones or complete mounted skeletons, but the sub-centimetre detail is unused, such as in convex-hulling specimens to estimate mass (Sellers et al., 2012). One real advantage of using the Kinect™ sensor in this way is that the model is produced on-the-fly, including meshing, so any errors (e.g. holes in the data collection) can be corrected whilst scanning, contrary to photogrammetry where the quality of the model is not known until after all processing is complete, which can take some time and is algorithms used on photogrammetric point cloud data may fail, or require time-consuming input from the user. 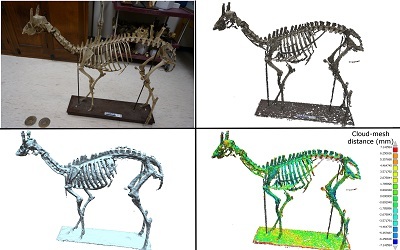 Of the samples used here, the pronghorn benefits from this immensely, as the Poisson Surface Reconstruction used to mesh the point cloud struggles to differentiate between close features, such as the ribs, as demonstrated in Figure 4. The meshed photogrammetric model could be improved dramatically by manually segmenting parts of the point cloud prior to surfacing, though obviously this would contribute considerably to the total time of the workflow. A significant disadvantage to using ReconstructMe or the Point Cloud Library Kinfu is that the scanning volume is limited, and must be set prior to scanning. Increasing that volume either decreases the resolution of the scan, or increases the graphics memory used. For the specimens used in this paper, this was not an issue, as the scanning volume could be set relatively small (< 1 m3) and a high resolution and low memory usage maintained. Fortunately, this limitation may be short-lived, as the pre-release version 7 of the Point Cloud Library contains an application ‘kinfu_large_scale’ which is able to record larger, dynamically sized environments (http://pointclouds.org/documentation/tutorials/using_kinfu_large_scale.php. Another disadvantage is that the models produced in this paper by the Kinect™ lack any colour information. This is in contrast to photogrammetry, and some traditional laser scanners which can photo-texture their resulting models. However, in addition to the infrared depth sensor, the Kinect™ (and Asus Xtion Pro) also possesses RGB cameras capable of recording colour information. Although in the early stages of development, all of the relevant software packages discussed here are actively developing features to incorporate texture generation.